FEATURES TEAL SHIRT WITH PINK GLITTER "23" - "AIR JORDAN" ON FRONT~! TYPE: Girls Short Sleeve Graphic Heart Shirt. SLEEVE: Short. COLOR: Blue. MATERIAL: 60% Cotton 40% Polyester. GIRL'S MUDD LOVE HEART ROLLED CUFF SLEEVE T-SHIRT TOP. SOUTHWESTERN LOOK. ARMPIT TO ARMPIT, LAYING FLAT IS 15". Harry Potter Youth Chibi "Up to No Good" Purple Shirt Size M (7/8) LOT OF 2! Harry Potter Youth Chibi "Up to No Good" Purple Shirt. Size M (7/8). We will take care of the problem quickly and give a fair response. Up for sale we have this adorable pink long sleeve shirt by Gap kids in a size XXL (14-16). Super cute! Size Medium ( 4 ) , 100% cotton exclusive of decoration. 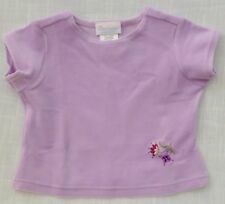 NWT new with tags MSRP $19.50 vintage Gymboree Apple For the Teacher line , Orchard Embroidery Top long sleeve . NWT Girls Long Sleeve V-neck Sport Shirt White Loose Fit Sz M. Condition is New with tags. Some of the pictures in this listing reflect a size Large shirt but this listing is for a Youth Medium. This will be coming to you from our very clean and smoke free home. Please message me with any questions. Thank you for looking and happy shopping! 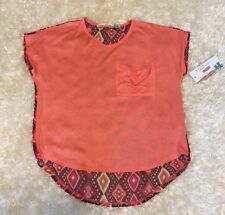 NWT Girl’s NIKE Shirt. White Size Medium (6). Condition is New with tags. Shipped with USPS First Class Package. Bell ruffle sleeves. Blue chambray/denim with floral embroidery.